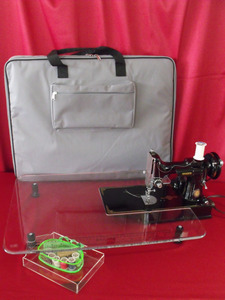 I received my Sew Steady 222K Featherweight table today and it is wonderful! Turned my little 222K into a "big" sewing machine. I decided on the clear table so I could store things underneath it and still be able to see them. The notions box is such a great idea! So handy! Or should I say sew handy?! And having a bag to carry it all in is a major plus. This is an excellent deal with all that is included for under a hundred dollars! Buy one, you won't be disappointed! All brands always exceeds my expectations with their prices and speed of shipping. Thank you! The box arrived without any damage, items inside were secured. I did find trouble unzipping the travel bag all the way. It became stuck on the last short end. Even after several attempts, it appeared permanent and did not want to do any further damage. Please let me know if I am to return just the bag in the original box. I did talk to the gal at your office and was told she thought a new bag would be mailed and not to return the first bag. Very pleased with my purchase and how quickly it was available. Thank you so much for your wonderful selection and great sales! Also, I will shop with you again due to you having the best prices! Fast shipping and love the follow up!